Please note that not all the items listed below are both mint and boxed: some are mint and unboxed, others are boxed but not mint, and there may also be items that are new old stock but in less than perfectly pristine condition. More on our condition scale here. 12337: American Pencil Co. "The Twins" dip pen and pencil set in box: giant novelty set, wood with swirl-pattern lacquer finish, pen is 25.5 cm long excluding steel "Midget" falcon nib, octagonal "Whoopee" pencil is a real pencil, with thick lead all the way through. Usual age cracquelure to finish, box split at one end, as new with just age and storage wear. 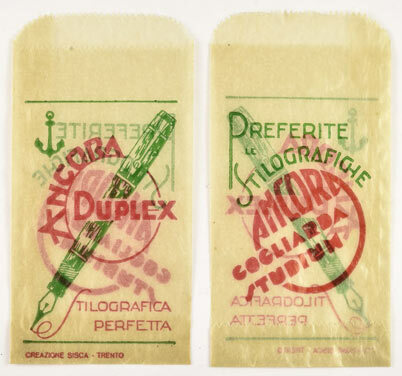 4251: Ancora glassine envelope: advertising for Duplex pens, 5 x 9.5 cm, printed on both sides, new old stock. 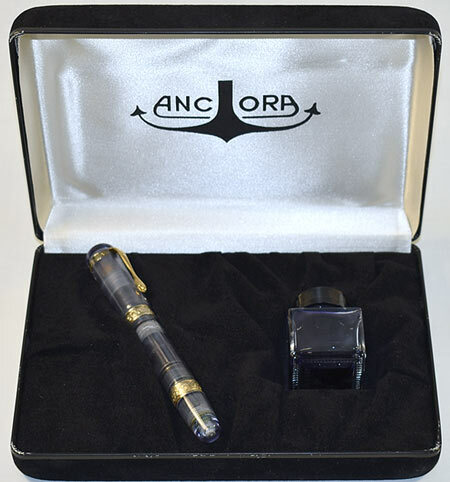 13948: Ancora demonstrator in box: limited edition of 200, large transparent green piston-filler, 14.8 cm long, gold-plated sterling silver vermeil trim, 18K gold nib; original packaging including outer sleeve. 13949: Ancora Cielo demonstrator in box: limited edition of 500, large transparent pale blue piston-filler, 14.4 cm long, gold-plated sterling silver vermeil trim, 18K gold nib; original packaging includes ink bottle, no outer sleeve. 13947: Ancora 80th Anniversary Grand Complication Silver Demonstrator in box: limited edition of only 33, transparent with complex retracting nib mechanism, sterling silver trim, 14.8 cm long, 18K white-plated nib, in elaborate transparent display box with all accessories and papers, outer box. 13958: Ancora Raphael demonstrator in box: limited edition of 88, oversize transparent piston-filler, 13.75 cm long, gold plated trim, 18K gold nib, in large elegant wooden box, with outer cardboard box; new and unfilled, noting some age deterioration to the synthetic lining of the box. 12907: Asprey writing set in box: sterling silver dip pen, desk pencil, and paper knife with seal end, pen 16.6 cm long excluding plated nib, pencil uses 1.5 mm "VS" lead; all three pieces engraved "LW", bear London hallmarks with maker mark "JH" (John Hill? ), lightly scribed jeweler's inventory numbers. "ASPREY" appears only on the silver blade of the paper knife. 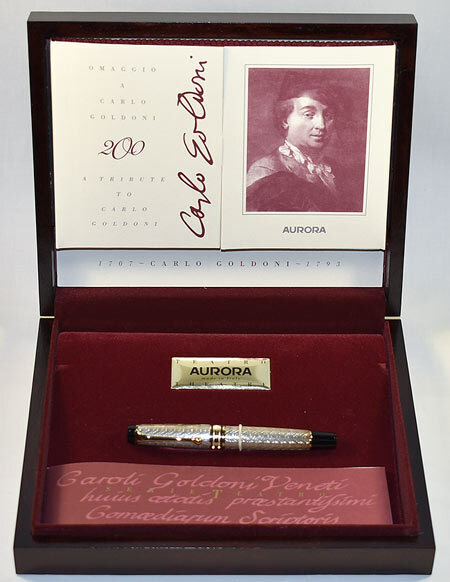 13951: Aurora Carlo Goldoni in box: limited edition of 1793, piston filler with engine turned sterling silver cap and barrel, 12.9 cm long, gold plated trim, 18K gold nib; boxed with papers. 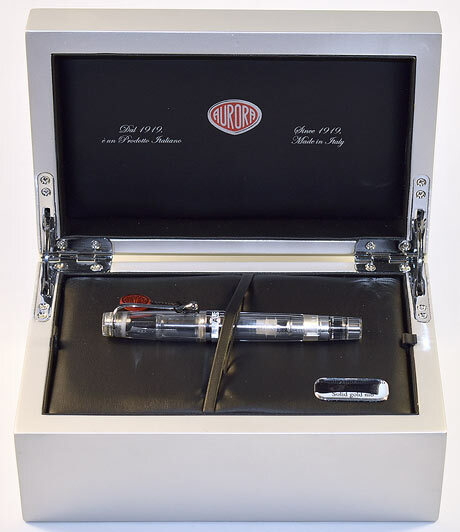 13885: Aurora Optima 75th Anniversary in box: limited edition of 7500, red marbled piston-filler, 12.5 cm long, gold plated trim, 18K nib, boxed with all paperwork, special ink bottle; crease in cover of instructions (standard booklet, not special to this edition). 13950: Aurora Sole set in box: limited edition of 7500, orange marbled piston-filler, 12.7 cm long, gold plated trim, 18K nib, with ballpoint pen, all matching numbers; boxed with special ink bottle. 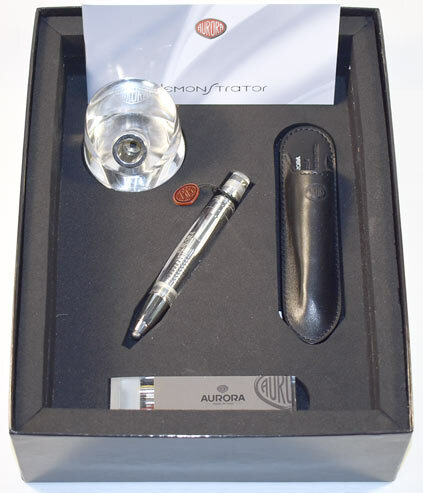 13957: Aurora 88 demonstrator in box: original limited edition of 1888, transparent piston-filler, 13.1 cm long, chrome plated trim, 18K rhodium plated nib; with all original packaging. 13960: Aurora Optima Sketch Pencil demonstrator in box: limited edition of 936, transparent clutch-action thick (5.6 mm) lead holder, 11 cm long, chrome plated trim, 18K gold nib, with all original packaging including transparent desk base and leather carrier; has been lightly used, but appearance as new noting internal stress marks visible in the barrel (see detail), which do not affect function, may be covered under Aurora's guarantee. 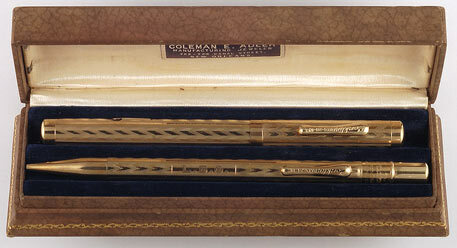 13956: Aurora Optima demonstrator in box: limited edition of 1936, transparent piston-filler, 12.7 cm long, chrome plated trim, 18K gold nib, with all original packaging; internal stress marks visible in the barrel around the filler unit (see detail), do not affect function, may be covered under Aurora's guarantee. 13900: Bexley Blue Sky set in boxes: limited edition of only 100 fountain pens and 50 Multi-Max sets, exclusively for Regina Martini; matching numbers, transparent pale blue with silver streaks, fountain pen is 13.3 cm long, piston-filler with 18K white gold nib, solid 6K white gold clip and matching trim, Multi-Max can use thick graphite, ballpoint, or highlighter refills. All boxed, with instructions. 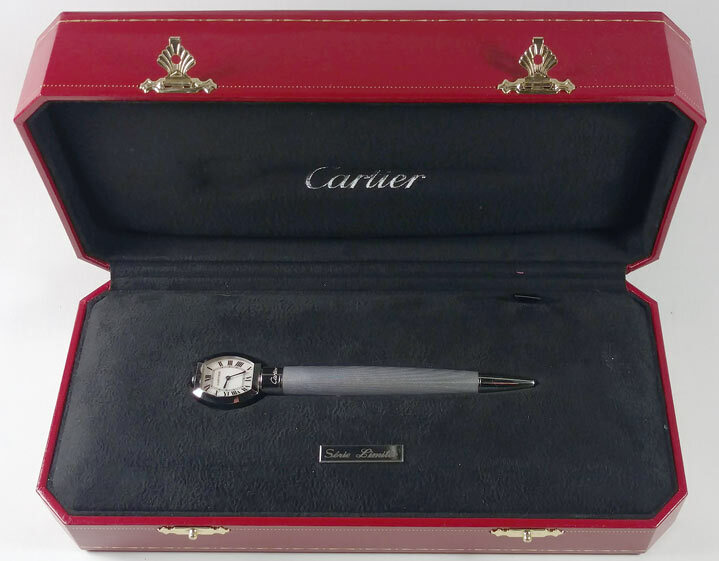 13250: Cartier d'Exception ballpoint with watch in box: limited edition of only 2000 pieces, grey lacquer with platinum finish, mother of pearl dial, full packaging including outer box, matching numbered certificate, other accessories. Watch may require battery replacement. 13773: Cross stylographic pen in box: black chased hard rubber eyedropper-filler, 12.5 cm long, gold filled trim, crisp and glossy with patent dates January 29, 1878, May 24, 1881; tip intact but needle frozen inside, broken off internal spring mounting (see detail), small tool marks on section, otherwise as new, in box marked "WATERLOW & SONS LIMITED LONDON". 7659: Cross stylographic pen: black chased hard rubber eyedropper-filler, 11.9 cm long, thick model with unusual chased cap; crisp and glossy, bold section imprint without patent date, has been converted to a scribing tool -- probably as a means to recycle unused but obsolete old stock (not usable as a pen).